Often, when folks know I ride trains quite a bit, they ask me what train ride to start with, perhaps with their children or grandchildren. For a turn-around trip in one day, with ocean views, I suggest going from Orange County, California, to Santa Barbara and back. First, I decide which trains I want to take ,then I go online and purchase my tickets and print them at home. After a suggestion from our son, I take a photo of the ticket, including the code. That way, the Conductor can scan my paper ticket code or the photo on my iPhone of the code. I see most riders have their ticket on their smart phone. Next, I copy maps and schedules for this report on TrainWeb.com. Finally, I make it to the train on time and begin taking photos of the trip. My ticket, Conductor uses his/her ray gun to scan the bar code on a paper ticket, or e-ticket, or photo of e-ticket, then puts a "hat check" above your seat indicating by a hole punch how many people are on that ticket, and a color indicating the destination station. This time the hat check had SBA written on it by the conductor. Return on Train No. 782 leaving Santa Barbara at 12:49 and returning to Fullerton at 4:39 p.m.
Our son, Matthew Morrison, collects Disney pins, so he gave me this one for the trip. When leaving from the Fullerton Station, I purposely park on the top deck of the parking structure west of the station, beyond Harbor Blvd. This allows me, when walking to the train, to see the tracks which often have either a BNSF freight, an Amtrak Surfliner, or a Metrolink in motion or doing station work. On this day, it was quiet, but by the time I was down on the platform, there were many trains passing through the station. Most freights from the east go through the station on the middle Track No. 2, but this morning one passed on track one. The sprinkles had stopped, but a collapsible umbrella is a good idea. A southbound Surfliner arrived before my northbound 563. No. 563 arrived in typical push mode northbound between San Diego and Fullerton. I like to go to the upper level on the Amtrak Surfliner bi-level cars. This level provides a seat about 10 feet above the tracks and a view above smaller trackside objects. However, the lower level provides seating for Seniors or ADA passengers, with no stairs to climb. The 4 facing seats in the center of the car (some with tables) are reserved for 3 or more passengers traveling together. Gary had boarded in Irvine since he lives in Aliso Viejo near Laguna Beach and this is his nearest station. He texted me as to which car he had boarded and I found him when I boarded in Fullerton. 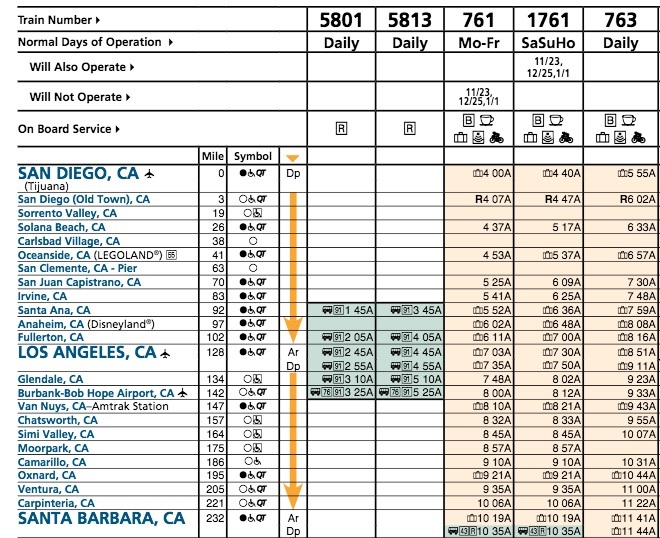 Burbank Airport is the closest Southern California Airport to an Amtrak Station. It has a covered pedestrian walkway from the terminal to the Amtrak Platform. Van Nuys airport had some fire fighting helicopters and fixed wing aircraft which had been used in recent fires. Coastal range and edible crops approaching Oxnard, California. Staked tomatoes, palm trees, ocean, and Santa Cruz Islands approaching Oxnard. Where the Ventura River meets the Pacific Ocean and the beginning of the train's run along the sand. Looks like a driftwood shelter from wood washed to the beach down the Ventura River. When boarding northbound south of Los Angeles for a trip north of Los Angeles, I had told Gary earlier to pick a seat on the land side, riding backwards. Then, as we turned around on the stub-in tracks in Los Angeles Station, he would be on the ocean side facing forward for most of the trip. I usually title this shot from the Amtrak Survlfner north of Ventura, "Why they call it the Surfliner." 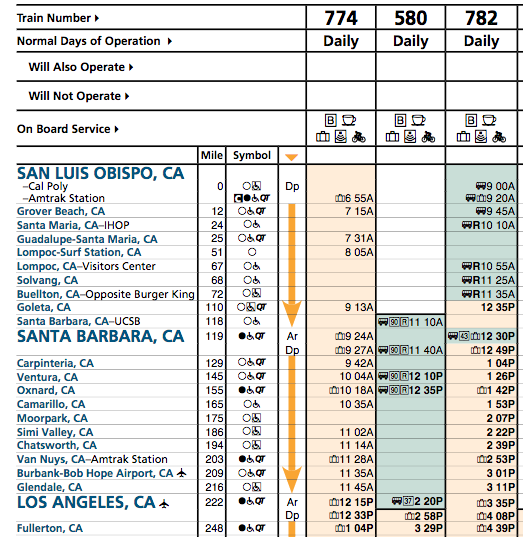 The section between Ventura and San Luis Obispo is called, "The longest ocean view train ride in America." Off-shore drilling islands camouflaged as palm tree islands, but the pipes are a give away. More modern off-shore drilling rigs in the Santa Barbara Channel. Fishing boats, drilling platforms, naval ship in Santa Barbara Channel. While looking out the window along the ocean, I wondered if the narrow road between the train and the water was old Hwy. 1. You can check this by going to Google Maps which shows your current location. Select satellite view and sure enough, the road between the tracks and the surf is old Hwy. 1, with the current 101 Freeway farther inland. The above image is a screen shot from my iPhone. Another app I like to use on the train is "Speedometer". I like to have it running, then ask my travel partner, "How fast do you think we are traveling?" They usually guess slower than the actual speed which I show them. 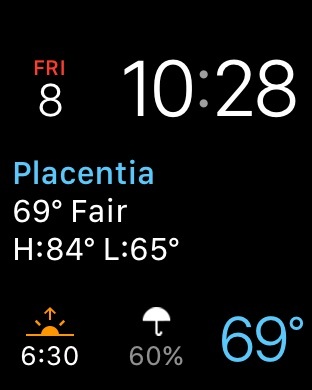 I have my iWatch set to give me the Day, Date, Time, current temperature, Weather, High temp., Low temp., sunset or sunrise whichever is next, % precipitation and large temperature. As we go through a spot on a train trip, I can look down and see all these things. Which is good on a long distance trip when someone asks, "Where are we?" It is good to take a screen shot for future reference for your trip photos and log. Arrival in Santa Barbara and a short walk to the Enterprise Fish Company for lunch. 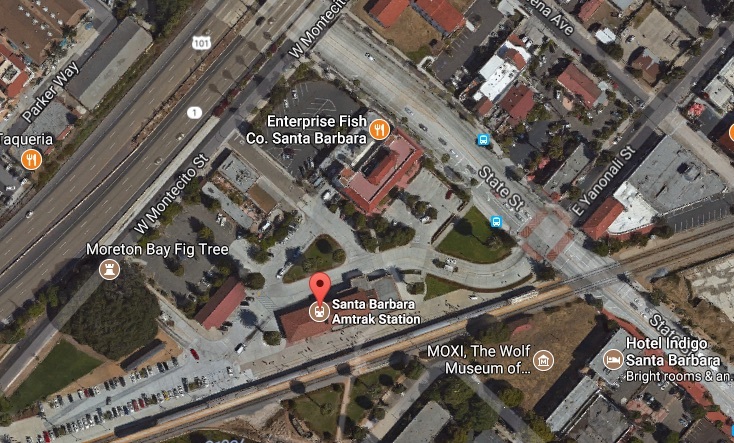 Our schedule was to arrive in Santa Barbara at 11:44, have lunch at Enterprise Fish Company, and board the return train for 12:49 departure. Since we arrived about 10 minutes late, that was a push to have lunch and return before before the train left. A familiar former resident has a museum next door to the Enterprise Fish Co. The quickest lunch you can get at Enterprise Fish Company would be chowder or a salad. Even if you order an entr�e that takes some time to prepare, tell your waiter you have to catch a train and they will bring you a to go box, which Gary made good use of. A couple of interesting vehicles on State St. near the Amtrak Station. Back to the station after lunch and a quick photo of the Coast Starlight heading north to Seattle. On the way home, I had more fun using the on-board "AmtrakConnect" Internet connection. I realized the onboard Internet connection had an option to Track our Current Location. Another screen slows current location and the arrival times down the line. There certainly is no lack of smart phone use on the Surfliner. I like this round trip Fullerton to Santa Barbara, since I still got back home before dark.